Economize R$ 18,57 (28 %). Comprar eBook Kindle. 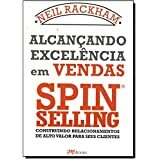 Comece a ler The Ultimate Sales Machine no seu Kindle em menos de um minuto. Chris Steiner is the author of $20 Per Gallon, a New York Times bestseller. His writing has appeared in Forbes, the Chicago Tribune, the Wall Street Journal, Fast Company, and more. He holds an engineering degree from the University of Illinois at Urbana-Champaign and a masters in journalism from Northwestern University. Steiner lives in Evanston, Illinois, with his family. This is the 3rd purchased, my 1st copy lend to my former boss, she loves it. The book never return back to me. So I had to buy another one. This time I bought 4 more copies and gave it to the President, SVP, VP in the new company that I'm currently working for. 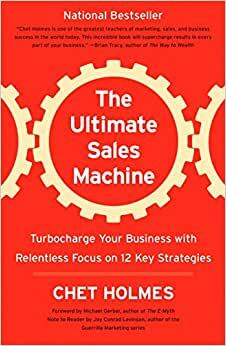 This book did a wonderful job concluded what REALLY matters to a business: create a system and create sales strategies, stay focus with consistent efforts. When I came to my last job, it was chaotic and most people cannot last 3 months in that position. I used the ideas in this book, approached my boss, offered to help her to do an audit and see where went wrong, I wrote a training guide to standardize how we operate and things getting much better. I saw very little value to rehab our division because it does not bring in revenue, so I proposed the idea to help improving company's sales and marketing division. Then the company was hit by lawsuit so I wasn't able to. This book can help your company dominate the market, position yourself, handle the growth and scale fast. The only piece missing is corporate finance. Since I read at least 1 business and investing book per week I was constantly evolving. I realized merely has stunning sales record and a great business system would not be enough. Currently, I am learning how to read financial statement like lenders or investors. And I come to realization that majority of the management were not financially sophisticated enough. If you are the company executives, I would recommend you inspect how management spending on each and every check that comes out. Again, this is still something I learned from this book: if you want to find out where is the problem, you have to do a review and audit, you have to spend time working on the business not in the business. There are a lot of fluffy books talk about leaderships and visions, they were nice to read but fail to make an impact to real business operations. This book stands out, it was packed with information, its specific, the ideas are actionable, unlike some other books only tells you half of the story and hope to upsale you to get another half, this book does the lead generation too, but it gives you the whole picture, you can use the ideas in this book and making impact right away! This book has no BS, it has almost everything you need to know to make your business the top 1%. Holmes’ book is entertaining and powerful. He starts by focusing on habits – because so much of sales is habits and mindsets, gets into running effective meetings and creating strategies, then tackles sales team building, and attracting the best buyers. It's highly readable and entertaining. The biggest takeaways: Be disciplined. Stick to a few strategies and get really good at them. Figure out how to educate your market. Then go after them. People overrate this book. People act like this book revolutionizes selling, but it resembles other sales books. It can help beginners and it can offer tips to the experts, but it doesn't live up to the hype. Furthermore, Holmes condescends to the reader and shows off like a braggart. I like thinking about selling, so this book does inspire thought; just don't expect it to change your life. 5,0 de 5 estrelasExcellent book. Right up there with the E-Myth. A client of mine recommended this book. I almost didn't buy it due to the comment: "OK if you're selling carpet cleaning services.". I just finished the book and what a disservice that comment was. The author only mentioned carpet cleaning maybe twice (he worked with a carpet cleaning company and mentioned what he had done for them). There were plenty of other industry examples he used. I thought this was a sales book but it covers a lot more than just sales. For example, tips on time management, conducting meetings, managing people, and more. I have read a lot of books on management. I would say I have come up with a list of about eight that I would recommend. This book, along with the E-Myth is one of my favorites. I ordered both the book and the Audible version. I can't say that I am any fan of Audible.com. Their required desktop software is old and antiquated. 5,0 de 5 estrelasThis book is the how to proceeded by the why to!!! I’m not a salesman by occupation, but I’ve always had to sell something, even if just myself to a potential client, and once upon a time, to a potential wife. I’ve always been interested in marketing, sales and anything related to persuasion (providing compelling reasons to do or not to do a thing), so I’ve read a lot of marketing and sales books in my fairly long lifetime, and this has been the best yet. This book is not a bunch of theories on how you might become successful in marketing and sales, it’s hot feet and hands. It’s how to proceeded by why to.